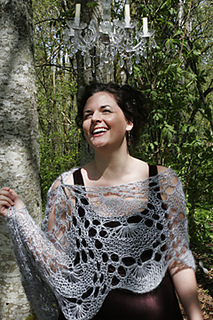 This pattern is available from frenchgirlknits.com for $7.00. 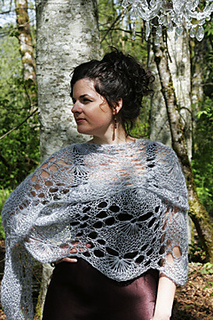 Weaving spider webs and starlight, Diamanta spins a cocoon of loveliness, fabricated in Rowan Kidsilk Night and Rowan Lurex Shimmer. Diamanta's name springs from an ancient French name meaning, "like a diamond" … shine on, and wear it knowing your true worth! Lurex Shimmer is now discontinued; feel free to substitute any sparkly/shimmer lace weight/fine yarn.